This article is about the year 1558. Wikimedia Commons has media related to 1558 . Year 1558 ( MDLVIII ) was a common year starting on Saturday (link will display the full calendar) of the Julian calendar. 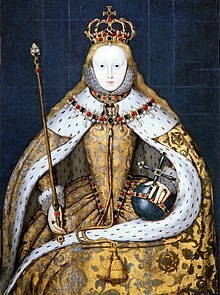 November 17: Coronation of Queen Elizabeth I of England. 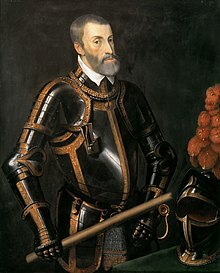 January 7 – French troops, led by Francis, Duke of Guise, take Calais, the last continental possession of the Kingdom of England. January 9 – Geneva becomes independent from the Canton of Bern. January 22 – The Livonian War begins. February 2 – The University of Jena is founded in Thuringia, Germany. 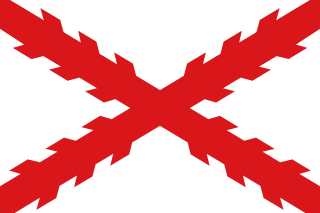 February 5 – Arauco War: Pedro de Avendaño, with sixty men, captures Caupolicán (the Mapuche Gran Toqui), who is leading their first revolt against the Spanish Empire (near Antihuala), encamped with a small band of followers. April 24 – Mary, Queen of Scots, marries Francis, Dauphin of France, at Notre Dame de Paris. July 13 – Battle of Gravelines: In France, Spanish forces led by Lamoral, Count of Egmont defeat the French forces of Marshal Paul de Thermes. July 18 – The city of Tartu, capital of the Bishopric of Dorpat (in modern-day Estonia) surrenders to Russia. October 17 – Postal history of Poland: King Sigismund II Augustus appoints an Italian merchant living in Kraków to organise a consolidated postal service in Poland, the origin of Poczta Polska. November 17 – The Elizabethan era begins in England: Catholic Queen Mary dies, and is succeeded by her younger Protestant half-sister Elizabeth, who will rule for 44 years. July 13 is the 194th day of the year in the Gregorian calendar. There are 171 days remaining until the end of the year. 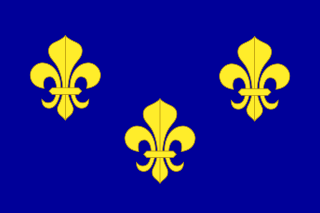 The Battle of Gravelines was fought on 13 July 1558 at Gravelines, near Calais, France. 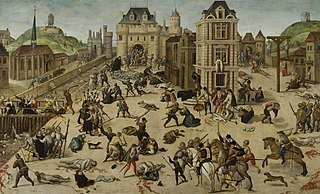 It occurred during the twelve-year war between France and Spain (1547–1559). 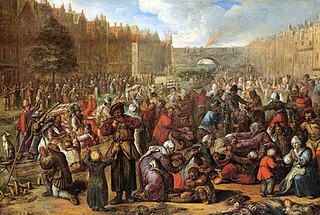 John Knox's attack on female rulers, The First Blast of the Trumpet Against the Monstruous Regiment of Women , is published anonymously from Geneva. Queen Elizabeth grants rest and refreshment to pilgrims and travellers who pass by the Holy Well Spring at Malvern in England. John Knox was a Scottish minister, theologian, and writer who was a leader of the country's Reformation. He was the founder of the Presbyterian Church of Scotland. The First Blast of the Trumpet Against the Monstruous Regiment of Women is a polemical work by the Scottish reformer John Knox, published in 1558. It attacks female monarchs, arguing that rule by females is contrary to the Bible. 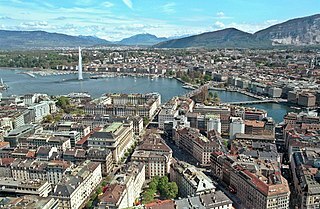 Geneva is the second-most populous city in Switzerland and the most populous city of the Romandy, the French-speaking part of Switzerland. Situated where the Rhône exits Lake Geneva, it is the capital of the Republic and Canton of Geneva. Meir Lublin or Meir ben Gedalia was a Polish rabbi, Talmudist and Posek. He is well known for his commentary on the Talmud, Meir Einai Chachamim. He is also referred to as Maharam. 1616 (MDCXVI) was a leap year starting on Friday of the Gregorian calendar and a leap year starting on Monday of the Julian calendar, the 1616th year of the Common Era (CE) and Anno Domini (AD) designations, the 616th year of the 2nd millennium, the 16th year of the 17th century, and the 7th year of the 1610s decade. 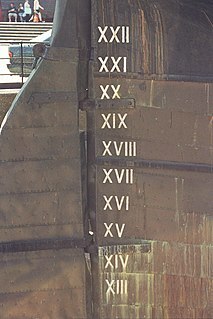 As of the start of 1616, the Gregorian calendar was 10 days ahead of the Julian calendar, which remained in localized use until 1923. Kōriki Masanaga was a Japanese daimyō of the Azuchi–Momoyama period, who ruled the Iwatsuki Domain. Masanaga, like his father Kiyonaga, served the Tokugawa clan. Hendrick Goltzius was a German-born Dutch printmaker, draftsman, and painter. 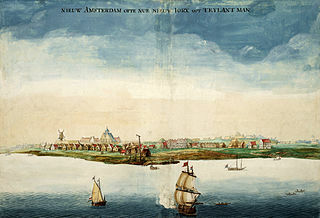 He was the leading Dutch engraver of the early Baroque period, or Northern Mannerism, lauded for his sophisticated technique, technical mastership and "exuberance" of his compositions. According to A. Hyatt Mayor, Goltzius "was the last professional engraver who drew with the authority of a good painter and the last who invented many pictures for others to copy". In the middle of his life he also began to produce paintings. Year 1572 (MDLXXII) was a leap year starting on Tuesday of the Julian calendar. Year 1540 (MDXL) was a leap year starting on Thursday of the Julian calendar. 1643 (MDCXLIII) was a common year starting on Thursday of the Gregorian calendar and a common year starting on Sunday of the Julian calendar, the 1643rd year of the Common Era (CE) and Anno Domini (AD) designations, the 643rd year of the 2nd millennium, the 43rd year of the 17th century, and the 4th year of the 1640s decade. As of the start of 1643, the Gregorian calendar was 10 days ahead of the Julian calendar, which remained in localized use until 1923. Year 1530 (MDXXX) was a common year starting on Saturday of the Julian calendar. ↑ Grun, Bernard (1991). The Timetables of History (3rd ed.). New York: Simon & Schuster. p. 247. ISBN 0-671-74919-6. ↑ Sykes, Percy (1921). A History of Persia. London: Macmillan and Company. p. 64.